13 of 32 for 219 yards with two touchdowns and two interceptions. Christian Ponder completed 40.6% of his passes for a quarterback rating of 59.3. With numbers like that and had you not seen the game, you might be asking what we’d gained by swapping a rookie for a veteran quarterback. The started began with a bang but, unlike nearly every other game this year, it did not end with a whimper. The first play from scrimmage featured a play-action roll out on which Ponder hit a wide-open Micheal Jenkins deep, who took it to the one yard line. While Adrian Peterson was stuffed on the next play, we were treated to Packers linebacker Clay Matthews getting destroyed by defensive tackle-turned-fullback Letroy Guion. Ponder finished the drive with a perfectly placed pass on a roll out where only Visanthe Shiancoe could come down with it for the first touchdown pass of his NFL career. After Toby Gerhart recovered Randall Cobb‘s fumble on the punt return, we got to see how the offense is supposed to work when defenses are forced to respect the pass. Adrian Peterson took it for twelve yards on one of many amazing runs during which he displayed his stunning, sudden change of direction ability. Ponder followed that run by a roll out, pump fake, and then tucked it for a six yard run. Forced to respect both the run and the pass, there were holes to exploit as Ponder hit Percy Harvin to convert on third down, then found Micheal Jenkins on a strike to the ten yard line. Though he was denied a touchdown on the sweep to the left, Peterson did move the chains enough to create a first and goal at the one yard line. From there, he took it up the middle and powered through three Packers, including an A.J. Hawk, who could not stop Peterson. Letroy Guion made a return engagement at fullback, this time destroying a cornerback off the edge on Peterson’s touchdown run. Cause and effect: When defenses are allowed to stack eight and nine men in the box all day, you can’t expect Adrian Peterson to dominate; you loosen things up with the threat of a passing game and he turns in a 175 yard rushing performance that featured one run of 54 yards. The Vikings quickly gave up an easy touchdown to Greg Jennings on blown coverage by Husain Abdullah, leading to a third quarter in which the Vikes gave up 20 points to the Packers. That type of faltering was typical of our second half collapses this season. But the Vikings rebounded in the fourth quarter with 10 points almost entirely thanks to Ponder’s ability to make plays. Fantastic blocking and the threat of a running game loosened up the defense for Peterson’s amazing 54 yard run with eighteen seconds left in the third quarter. Peterson broke three tackles on the run, maintained his balance when it looked like he was about to trip and was the beneficiary of a great seal block by fullback Ryan D’Imperio and downfield blocking by receiver Devin Aromashodu. That run set up a fourth quarter field goal by Ryan Longwell. The following drive was Ponder’s most impressive of the day. With time draining from the clock, the Vikings needed to score but were pinned down on their own seven yard line. Ponder marched the offense 93 yards for a touchdown. On the way, he hit Visanthe Shiancoe on a tightly thrown out route for twenty-two yards. He ran it himself up the middle for twelve yards on a quarterback draw. He found Greg Camarillo for sixteen yards to convert a third down on a bullet he threw across his body with Clay Matthews bearing down on him. Ponder took the shot from Matthews and got a roughing the quarterback penalty as a reward. On the next play, Ponder threw a fastball high and outside to Micheal Jenkins against the very Charles Woodson who had picked him off twice before and baited him all day. It proved to be too little, too late but on that play we saw a quarterback learn a lesson from mistakes made previously in the game. After apparently asking Donovan McNabb not to lose games, it looks like we’ve got a quarterback who’s going to win games. 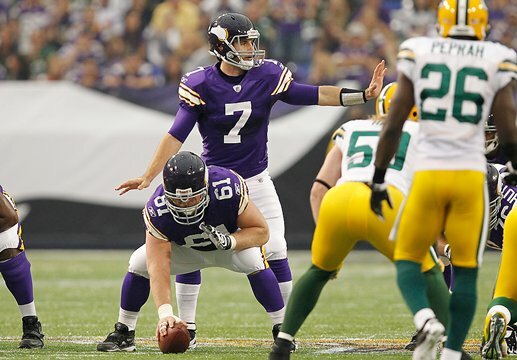 When he needed to make a play, more often than not Christian Ponder made them. It’s amazing I can say this, but I enjoyed this loss to the Packers. And I’m looking forward to Carolina. That’s a sentiment I didn’t know whether I was going to be able to enjoy this year.